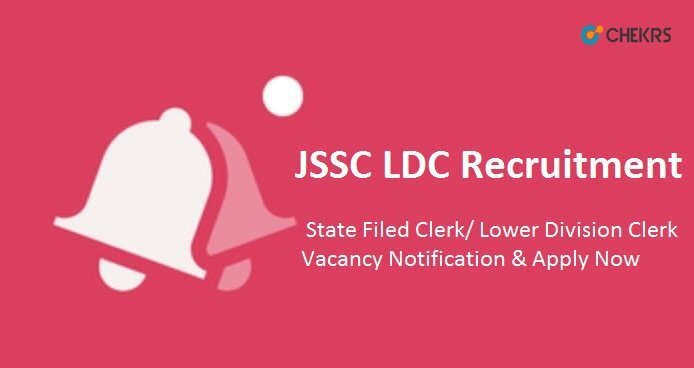 JSSC LDC Recruitment 2019: The Jharkhand Staff Selection Commission will be released various vacancies for State Filed Clerk Posts. The JSSC Department will fill-up vacant seats of Lower Division Clerk posts through the Written Examination. The candidates are informed that they must complete the JSSC LDC Recruitment 2019 Application Form before the last date. The Application Process has been started soon. For more details such as important date of application, job placement, official website, exam date, age Limit, candidates can check the Jharkhand SSC LDC Notification 2019. Latest Update: Jharkhand SSC is going to release the Lowe Division Clerk 2019 Notification for various vacant posts. Eligible & interested candidates can fill the application form before the last date from here. The Jharkhand Staff Selection Commission has been released Lower Division Clerk Recruitment 2019 Notification on the official website to fill up the various vacant posts. (झारखंड राज्य क्षेत्रीय लिपिक भर्ती): The JSSC Department has announced the vacancy notification in the various Department of Jharkhand through the JSSC FCLCE Exam Notification 2019. The Interested candidate can apply online for a Jharkhand SSC Vacancy Application Form before the last date. The candidate can check all required eligibility criteria for Lower Division Clerk Posts details like PayScale, Educational Qualification, Selection Process, Age limit, etc. The Candidate must have to pass Intermediate from any of the recognized Schools/ Board. As the advertised vacancies are to be filled through limited competition examination. Therefore, no maximum age limit for the candidate is included in this examination. Basic Payment of Lower Division Clerk Post:-Rs.5200-20200 (PB-I) with Grade pay 1900/- Per month. Click on the Online Application for FCLCE-2019. Fill the Basic, Post, Educations Details in the correct manner. The Selection Process will be based on performance in Written Exam and Personal Interview conducted by the Jharkhand SSC department. The Jharkhand will be recruiting Lower Division Clerk post in the various Department. Those candidates want to know about JSSC LDC Recruitment 2019 can continue to check our website that is www.jobs.chekrs.com. If you have any query about Jharkhand SSC Jobs that you can write comments on the commenting box and take a review or feedback.